We absolutely love this salad. It makes a great side but an even better main dish...so delicious you will want more! It offers an array of flavors - fruity sweet and veggie fresh, all with a scrumptuous, pungent dressing. You can serve it as a main dish with hard crust whole wheat rolls or with a small side of something like our Panko and Coconut Encrusted Tofu Medallions. We've included that recipe here as well. So, why not give this delicious meal a try...like, tomorrow? Bon appétit! Combine all fruits and vegetables in large bowl. peanuts can be added to salad mixture. Chopped peanuts can be added to salad mixture or stirred into dressing. Cover and refrigerate both until ready to serve. Pass dressing separately or toss with salad just before serving. Per serving: 310 calories, 10 grams of fat. two 1/2 thick slices. Cut the medallions out of each of the slices ( I use an empty pill bottle). You can choose to simply cut the slices into 1 inch blocks - it's cleaner and less wasteful but not as pretty! In a small bowl, mix the egg replacer with the warm water and stir well. This makes the equivalent of one egg. Add the pineapple juice, salt and saffron to the egg replacer mix and stir again to completely combine. Add the oil to a medium skillet or sauté pan and heat on high. When the oil is hot, drop the tofu medallions one by one, into the egg mixture and coat well. In another small bowl mix the Panko and the coconut. 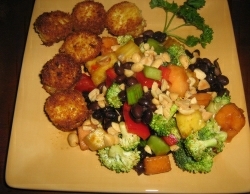 Then, using a fork, roll each tofu medallion in the Panko and coconut mix, covering well. Carefully place the tofu into the skillet and cook until golden; flip and cook until golden again then carefully turn them onto their sides and roll them in the oil to completely cook to a crispy coating on the outside. Plate and serve with the Indonesian salad. The juice from the salad also makes a great dip for the medallions.